October 29, 2010 - Dynamic Aviation, a leading provider of innovative aviation solutions to government and commercial organizations worldwide, announced its receipt of the Federal Aviation Regulations Part 121 certification from the Federal Aviation Administration and the launch of its new commercial airline business, Dynamic Airways. The new airline, which will operate nonscheduled jet services for government and commercial customers around the world, is based at Smith Reynolds Airport in Winston-Salem, North Carolina. ?This is a tremendous milestone for Dynamic Aviation and we?re excited to have the opportunity to build Dynamic Airways into a successful business to support the needs of both commercial and government customers with jet charter services,? said Michael Stoltzfus, president and CEO of Dynamic Aviation. ?We look forward to providing customers with highly reliable flight schedules and outstanding customer service in a manner that continues our company?s long tradition of service and excellence.? Dynamic Airways currently operates one MD-88 aircraft, with a second slated for delivery in mid-December. The company currently employs a team of 40 full-time and part-time personnel. 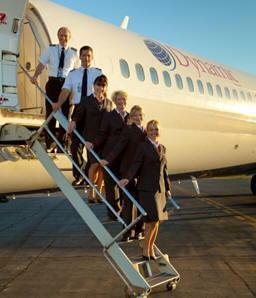 ?As home to where our aviation industry first took flight, we are proud to launch Dynamic Airways in North Carolina,? said Guy Cannady, Dynamic Aviation chief operating officer for Dynamic Airways. ?This new business will mean more jobs for the Piedmont Triad area and more aviation industry opportunities for the state.? Dynamic Airways aircraft are available for charter worldwide. Company executives are expecting the airline to serve the federal government as well as a variety of groups in the private sector, such as the tourism industry, collegiate athletic teams, private charter groups, and any other industries and groups that have a need for reliable, customized transportation. To complete its FAR Part 121 certification, an effort that the company began over a year ago, Dynamic Airways developed manuals, procedures and training programs, and also worked closely with the FAA and its regional and local affiliate organizations to demonstrate its ability to operate aircraft safely and comply with all safety regulations and standards. Additionally, throughout the process, Dynamic Airways was subjected to a rigorous financial and management fitness determination conducted by the U.S. Department of Transportation, which found it to be ?fit, willing and able? to act in the public interest as an air carrier. The company operates a 40,000-square-foot heavy maintenance and modification center, engine shop, and privately owned airport at its headquarters in Bridgewater, Va. It also operates an airline business that is headquartered in Winston-Salem, N.C. Dynamic Aviation employs approximately 550 aviation professionals, owns more than 160 aircraft and operates from 20 locations in 10 countries across four continents.